One good reason for purchasing a smartphone is that you can use them as 3D scanners. 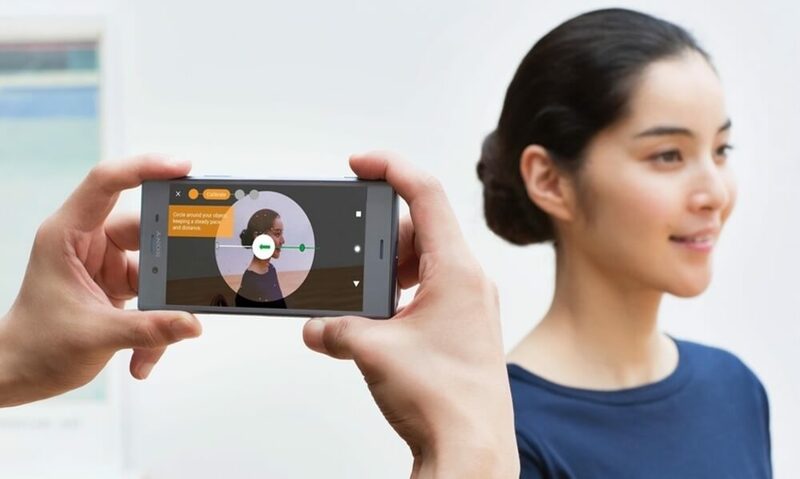 Some smartphones, such as Xperia XZ1 come integrated with a 3D scanning application. Some others, you have to choose and download yourself one. 3D scanning is the new trending feature in mobile phones so you’d better get to know how to use 3D scanning apps! It is quite easy to 3D scan an object or a person with a phone, but it is always good to have some tips. That said, we offer you some useful advice on how to succeed in your next 3D scan with your smartphone! What is a 3D scan? A 3D scan is the digital representation of the object or person you are 3D scanning. During the 3D scanning process, you are capturing the shape of an item (object, face or body of a person) using a 3D scanning application on your tablet or mobile phone, or even a proper 3D scanning device. The sensors of the individual device collect data related to the shape, the depth and the color of the item you are 3D scanning and they form the final 3D file. After the 3D scan is converted into a 3D file, you can edit the result with a 3D modeling application. This gives you the possibility to modify and use your 3D scan as avatar in VR (Virtual Reality) games or even to 3D print it. That’s how the object passes from the physical form to the digital one. We have previously introduced you to some 3D scanners on the market and some 3D scanning devices you can purchase, but these are addressed mainly to professionals or they are meant to be used for educational purposes. Nowadays, the most common and easy way to 3D scan something, is to use a smartphone or a tablet. 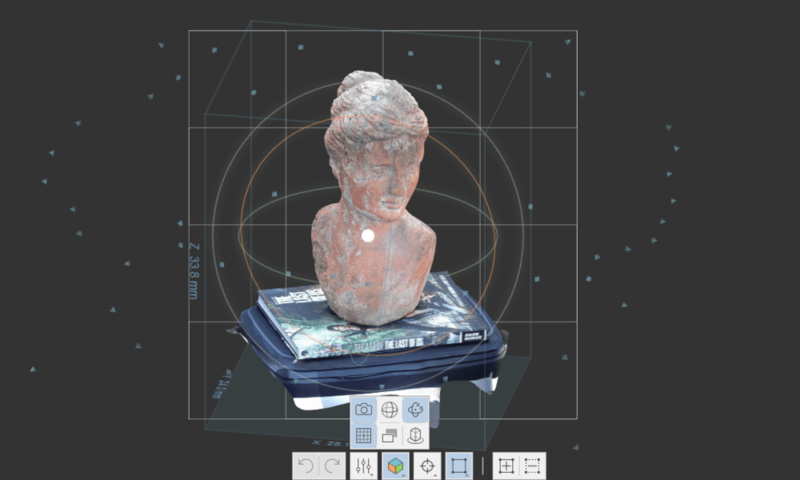 In our previous blog post, we explained you how you can make a 3D scan with a tablet. Today, we will explain you how you can make a 3D scan with a mobile phone! If you already have a smartphone, you can download one of the many 3D scanning apps that already exist in the market. In all the 3D scanning applications the same guidelines apply for a successful 3D scan, and we provide them for you! More or less, the procedure of the 3D scanning goes as following. First, you place the object or the person you want to scan to stand somewhere where you can walk around it/her/him. Then, you start the scanning procedure as indicated by the app, and the sensors of the camera of your mobile phone collect all the needed data. Once the 3D scanning is finished, and the data is collected, the app turns them into your digital 3D model. After that, you can save the result and 3D print it, use it as an avatar in Virtual Reality games or other applications. Even if the 3D scanning apps are already quite user-friendly and provide you instantly with guidance about how to proceed to the next step, it is important to follow some basic and useful guidelines for a successful 3D scan with a mobile phone. We offer you some basic tips about what to do and what to avoid when you make a 3D scan of an object and a 3D scan of a person. Make sure you use the proper light when you scan an object, either it is indoors or outdoors. It is recommended that you use bright light that spreads equally around your object, especially when you 3D scan during the night. For objects of complex geometry or objects that are hollowed or have edges, also mind the light not to create shadows as they will not be properly read by the 3D scanning software. Also, try to keep an equal distance when you scan around the object, so as to get a uniform result. Moreover, beware that your models fits the screen, so adjust your position and not scan neither from too far nor from too close. We recommend you to avoid 3D scanning moving or thin objects, such as tree-leaves for example. Also, try to avoid plain objects, as they lack of geometry complexion and they cause reflexions that cannot be captured properly during the 3D scanning procedure. In addition, when you 3D scan an object, beware of differentiating it from its background, so that the 3D scanning depth sensors capture the volume of the item. For this reason, since transparent objects cannot be differentiated from their background, they cannot be properly represented on a 3D scan. The procedure of 3D scanning faces of people is quite simple. To have a uniform 3D scanning result, scan the face from ear to ear by walking around the person. Make sure you capture different angles of the face, so that you don’t miss any edges of the face. It is important though that you keep an equal distance from the person as you walk around him. Since stringy objects are quite difficult to be captured, don’t be disappointed if the hair of the person you are 3D scanning are not represented in the best way. To get the best result, we advise you to place the person you are scanning in a background that is of only one color and bright enough, so that the depth sensors of the camera differentiate the head from its background. Last but not least, the person being 3D scanned should stand still and not move, as well as keep the same face expression during the 3D scanning procedure. It is now easier than ever to make a 3D scan with a mobile phone. For example, the new Sony Xperia XZ1, comes with an integrated application, called “3D creator”, which allows users to scan an item or a person in less than a minute! You are given the possibility of creating a 360° scan of anything you want with one of the 4 scan modes: head scan, face scan, food scan and freeform scan, and then send the object’s data file to Sculpteo online 3D printing service. The object will be 3D printed in multicolor material and users can choose from several predefined sizes. The video below illustrates how the application “3D creator” works and how you can further elaborate your 3D scan avatar. If your smartphone doesn’t come with a pre-installed 3D scanning application already, then you should download one. The 3D scanning apps we list below are based on photogrammetric method. Photogrammetry is a 3D scanning technology that creates 3D models out of 2D photos. It works by taking overlapping pictures of the object you are 3D scanning from different angles. Then, the software generates your 3D model by combining all these images together. Since high definition cameras are already installed on the smartphones, more and more 3D scanning software using this technology are arising. One of the best 3D scanning applications for mobile phones on the market is Trnio. This 3D scanning app is available only for iPhones and it offers two scanning modes: the object mode and the scene mode. For both modes you get instant guidance from the app. For the object mode, the user walks around an object and the app captures while the user moves in a circular pattern around the object. The scene mode is used for free formed scanning, meaning you can use it for 3D scanning outdoors scenes or large items. The greatness of this app is that it can be used as a social network too. You can create a profile with this 3D scanning app, create a collection of your 3D scans and people can follow your account as well as you can follow theirs. If you are looking for 3D scanning applications for Android smartphones, scann3d may suit you. The key success for this software is the design of its interface. Even if you are a beginner, it is very easy to use it, as you get instant reconstruction with the 3D model. It works by taking 20 to 30 overlapping photos around the object you are 3D scanning, and then the rendering is performed on the device automatically. The result of the 3D scan is ready in a couple of minutes according to the number of the input pictures. Later on, you can create a 3D model that can be shared on your Sketchfab account, without any post-processing! The itSeez3D 3D scanner app allows users to capture in 3D using their iPhone, connected to an Occipital Structure Sensor. This 3D scanner app offers great quality 3D scans by processing the photos on its cloud platform. It is able to capture people in 3D, procedure which takes between 5 and 10 minutes. However, the resolution is a bit inferior compared to resolution obtained while scanning smaller objects. The software is free to use, which means that it offers unlimited 3D scanning. Though, the exports of the generated 3D scans – that are available in common formats such as .OBJ, .PLY, and .WRL. – cost $7 each. Qlone is a 3D scanning mobile app developed with features near real-time 3D scanning and generates results locally, not through a cloud platform. In order for Qlone to be used, users need to print a black and white mat (similar to QR code). They then need to place the object they wish to 3D scan on top of the printed map. Users can print several maps depending on the object’s size. The key feature of Qlone is its merging capabilities. The 3D scanning app is able to merge two different poses of the same 3D scanned item for a better overall result. Users can also share their 3D captures with friends on social media platforms such as Facebook, WhatsApp, and other apps. Qlone is a free application, but the exports of the generated 3D scans – that are available in common formats such as .OBJ, .STL, .PLY and .X3D – cost $0.99 each. Bevel is a 3D scanner app for smartphones that is compatible with both iOS and Android devices. Bevel requires a small extension to operate. It is very simple though. You just have to plug and connect it to the smartphone through the headphone jack. 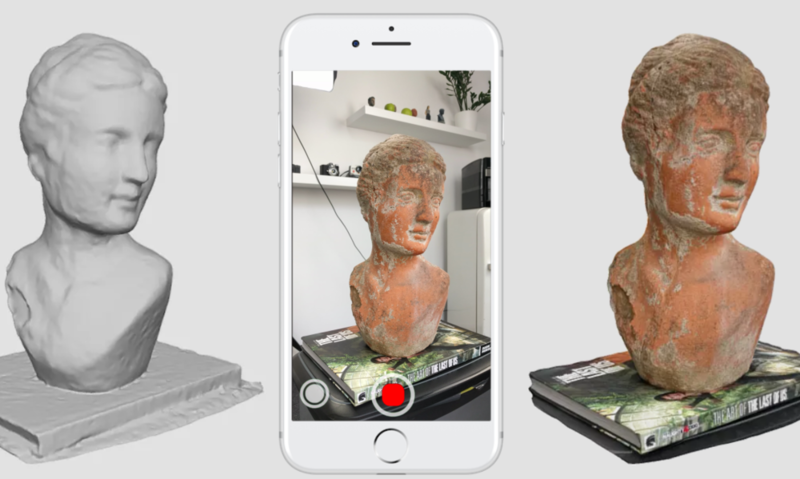 This 3D scanner app uses an eye-safe laser to capture scale and geometric detail, while the smartphone’s camera captures color, texture and other details. Unfortunately, this smartphone 3D scanner is currently not able to generate 360° 3D scans. As a counterweight to this, it is a very fast app, as it only takes a few seconds to capture an object in 3D. Even if the device is priced at $89, the 3D scanning app is free to download and use. If you want to read more about 3D scanning topics, you can read these blog posts about 3D scanning mistakes that impact your 3D prints and this one about photogrammetry process. 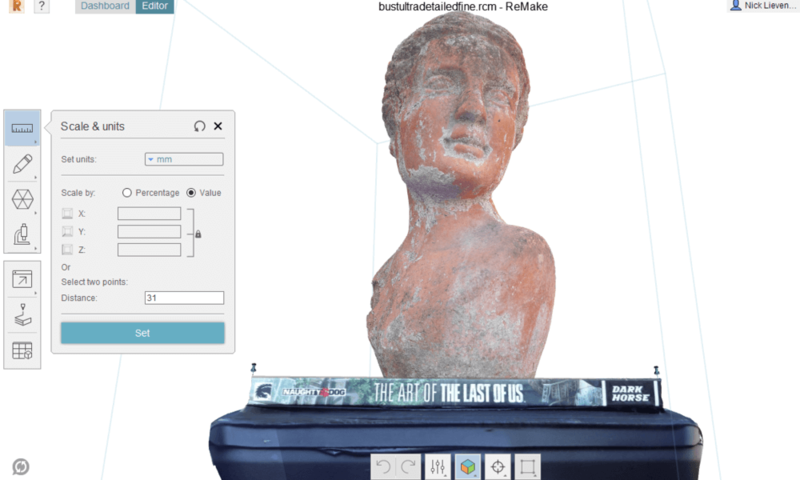 Also, you can check out this blog post about how to make a 3D scan with your tablet.